When Susan Warren decided it was time to focus more energy on herself and leave her high-powered career in Vermont to relocate to the quieter atmosphere in Lewes, she knew one of her goals would be to give back to her new community. After starting in the Anatomic Pathology Department of the Laboratory at Beebe in September, Susan found her chance to give back in the PAWS for People program, which connects service dogs and owners with patients. Beebe Healthcare kicked off its pet therapy program in 2014 for patients, visitors, and team members. This alternative therapy has been shown to decrease blood pressure and improve even short hospital visits for patients and visitors. In addition, having a dog visit team members has been shown to greatly reduce stress. PAWS for People, a Wilmington-based nonprofit 501(c)3 pet therapy organization, recruits, trains, certifies, and places therapy teams in Delaware, Maryland, Pennsylvania and New Jersey. The PAWS organization helps coordinate teams at more than 130 locations, which now includes Beebe in Lewes. Beebe started with five service dogs and their owners; the organization now has 15 teams in the program. PAWS for People will hold two training sessions in June for those interested in providing pet therapy in a medical setting. For more information on the trainings, call Lee Halloran, Manager of Volunteer Services for Beebe Healthcare, at (302) 645-3531. 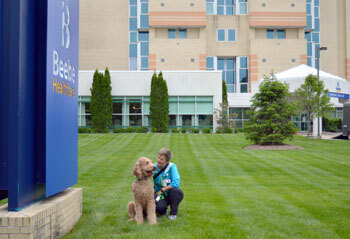 For Susan and her GoldenDoodle Oliver, the benefits for the patients are extremely rewarding. However, it was the impact of the program on herself that really surprised Susan. Just the other week, Oliver and I were visiting with a patient and her family. Oliver was visiting with each of the three visitors in the room and also going over to the patient in the bed. During one of his trips to the bed, Susan leaned over the patient, and a flicker of recognition went like lightning through her mind. While Susan was relishing in her experience, the patient’s family was also touched by the visit. The niece of the patient later posted photos from the visit to her social media page, exclaiming how impactful the pet therapy was for her aunt. “Pet visits help relax patients and allow them to reconnect to memories they may have had as children with a pet. Patients, visitors, and team members from all walks of life really benefit from pet therapy, and it is a joy to see how someone’s face lights up when the dog comes into the room,” said Jeannie Briley Wallo, Director of Patient Experience. Shown are Susan Warren and Oliver on their way to volunteer in the Medical Center.